Let's… Cancel Google, Shall We? | OhGizmo! Let’s… Cancel Google, Shall We? Here’s a little bit of geek fun. If you Google the term “Cancel Google”, the first result brings you to the page of Kevin Cheng, and Tom Chi. 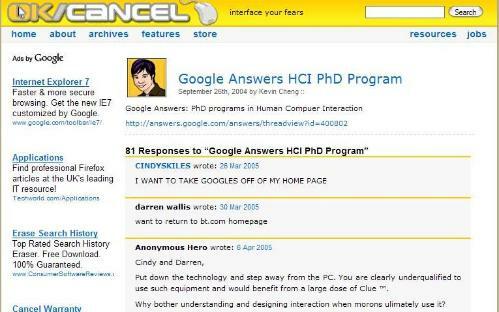 The website is called “OK/Cancel”, and on September 26th, 2004, Kevin wrote a post titled “Google Answers HCI PhD Program”. And just like that, their site has become the #1 destination of morons worldwide who’d like to cancel The Google. And it just goes on, and on. Keving initially deleted the comments, but later decided to leave them. They’re damn funny, that’s why.